Pac-Five players celebrated their first championship in Division II last night after beating ILH rival Mid-Pacific. There once was a time when a rule decreed that Pac-Five was not eligible to compete for state championships. That rule was amended a few years ago, and now, the Wolfpack are state champions. Samantha Hyde, Christine Tamamoto and Joanna Lawlor made their penalty kicks and Pac-Five edged nemesis Mid-Pacific 2-1 in a shootout last night for the Division II crown of the Meadow Gold/HHSAA Girls Soccer State Championships. A crowd in excess of 2,000 at chilly Waipio Peninsula Soccer Stadium saw Pac-Five (6-5-2) capture its first D-II title. "We dedicated this to our four seniors," longtime coach Eddie Wong said. "Our seniors have that maturity and experience, and that makes a big difference." In the shootout, Mid-Pac struggled. Miya Quinn's kick was stopped by Pac-Five goalkeeper Brittney Hutchins. Paige Young and Jenny Chan missed their tries. Meanwhile, after missing their first attempt, the 'Pack couldn't miss. Hyde drilled her shot to the right, out of the reach of MPI keeper Ashley Park. Tamamoto rolled her shot to the left and found net, and Lawlor rocketed her shot to the left. That attempt ricocheted off Park's hands and into the goal to give Pac-Five the victory. "I had to make (the win) official," said Lawlor, a freshman defender. It was an intriguing performance in PKs by Pac-Five, which had not been in a shootout all season. Hutchins, who played fullback for half of the season, drew raves from her coach. "For a field player, being converted to goalkeeper, she was excellent," Wong said. Mid-Pacific (6-8-1), which finished second to Pac-Five in the Interscholastic League of Honolulu, was quite spent after playing five games in seven days. The Owls traveled to Maui and defeated Seabury Hall to earn a state berth. Then, starting on Wednesday, they played four days in a row. Their quarterfinal and semifinal games were both settled in overtime. "I'm super proud of them," Owls coach Dave Pai said. "They can keep their heads up. I can't say enough about how they fought back." Playing each other for the third time this season -- they played to a draw and a Pac-Five win -- the Wolfpack and Owls were deadlocked in the first half. "They know us well enough where we had to change how we attack. We changed our formation before the game to take away the middle," Pai said. "Ashley (Medcalf) and Chris (Tamamoto) are real tough. It turned out really well for us." 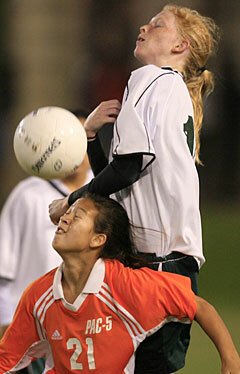 Pac-Five's Nicole Craig collided with Mid-Pacific's Kyla Graham while going for the header last night. The 'Pack got a scoring opportunity when freshman Sahara Searle converged on the ball 20 yards out and attacked goal. Hutchins came out to challenge Searle, who missed a 10-yarder from the right side at the 31-minute mark. Lawlor cashed in shortly after intermission. She sent a looper from 30 yards out that made it just under the crossbar. "It was off a cross. It was a rebound and I shot it outside of the 18, and it went in," Lawlor said. "I was overjoyed." The Owls adjusted. "After they scored, we had to put three up top," Pai said. Mid-Pac kept attacking and finally broke through at the 74-minute mark. In the midst of a crowd, Young drilled a left-footed 10-yarder to tie the game at 1. "(Sahara) had the ball and passed it to me, and I shot it," the freshman said. "I felt relieved." The Owls then went back to their normal formation, their third of the night. Park was tough, especially in the first overtime. Pac-Five's Jenna Matsumoto attacked from the left on a breakaway, but her 10-yarder was stopped by Park on the dead run. The Owls got a sliver of a chance in the second overtime, but Searle's cross missed Chan by a step. Pac-Five, likewise, had Matsumoto open, but the cross was off target and rolled away to the other side harmlessly. That set up the shootout. "They took the long way here, and that paid off for us," Pac-Five assistant coach Dave Barker said. "These poor guys had two overtime games in a row. When you're tired, you make mistakes." "The five games affected us," he said. "We didn't quite have it at the end, but they played hard, and as a coach, that's all you can ask for." Young lamented her team's missed opportunities. "We had them. We just couldn't finish it," she said. "But second place isn't bad." Wong, who has been with the Pac-Five program for more than a decade, couldn't hide his joy. "Division II gave us this opportunity," he said. "I'd really like to thank the HHSAA for allowing us to play in D-II, or else we'd still be battling the bigger schools in D-I."